This is an amazing technology called ‘Fairy Lights’ that creates touchable holograms using lasers. Notice that the hologram is interactive, it can change state during and after the touch. No glasses or goggles are required. The possibilities of this for film, theater, video games and theme parks are nearly endless. We’ve seen a few holographic technologies that have come close; they rely on optical tricks of one sort or another to make it seem like you’re seeing an image hovering in front of you. There’s nothing wrong with such optical tricks (if you can get them to work), but the fantasy is to have true midair pixels that present no concerns about things like viewing angles. This technology does exist, and has for a while, in the form of laser-induced plasma displays that ionize air molecules to create glowing points of light. If lasers and plasma sound like a dangerous way to make a display, that’s because it is. But Japanese researchers have upped the speed of their lasers to create a laser plasma display that’s touchably safe. 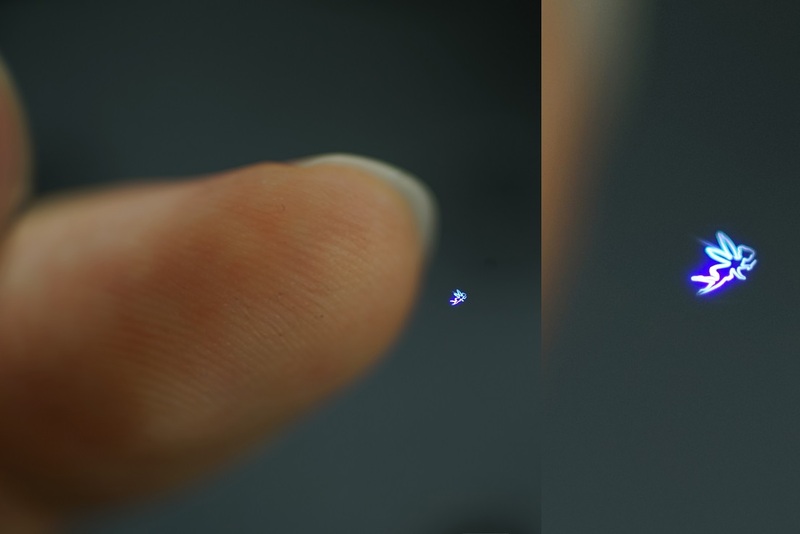 Researchers from the University of Tsukuba, Utsunomiya University, Nagoya Institute of Technology, and the University of Tokyo have developed a “Fairy Lights” display system that uses femtosecond lasers instead. The result is a plasma display that’s safe to touch. Our system has the unique characteristic that the plasma is touchable. It was found that the contact between plasma and a finger causes a brighter light. This effect can be used as a cue of the contact. One possible control is touch interaction in which floating images change when touched by a user. The other is damage reduction. For safety, the plasma voxels are shut off within a single frame (17 ms = 1/60 s) when users touch the voxels. This is sufficiently less than the harmful exposure time (2,000 ms). Shock waves are generated by plasma when a user touches the plasma voxels. The user feels an impulse on the finger as if the light has physical substance. The detailed investigation of the characteristics of this plasma-generated haptic sensation with sophisticated spatiotemporal control is beyond the scope of this paper. As you can see from the pics and video, these displays are tiny: the workspace encompasses just eight cubic millimeters. The spatiotemporal resolution is relatively high, though, at up to 200,000 voxels per second, and the image framerate depends on how many voxels your image needs. To become useful as the consumer product of our dreams, the display is going to need to scale up. The researchers suggest that it’s certainly possible to do this with different optical devices. We’re holding out for something that’s small enough to fit into a phone or wristwatch, and it’s not that crazy to look at this project and believe that such a gadget might not be so far away.